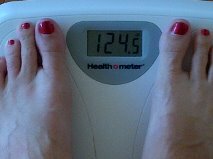 I have a physical every year, and for the last four years my doctor has told me, “You’ve gained another pound. I want you to stop doing that.” Because I’m getting older, she would like me to maintain my weight. She said that as I age, the weight will be harder to get off, so it’s best to not gain anymore. A couple of months before my physical this year, I knew I had gain a few pounds–All my clothes were tighter. What can I say, I had become a little less active and spent most of my time in front of my computer writing (I almost typed eating! LOL), so I hired a personal trainer. I figured I’d shape up before my appointment, so I could avoid the lecture about gaining another pound. I loved working out with a strict trainer, I felt great, and I even started looking a little better. “My diet hasn’t changed, and yes I still exercise.” I answered, but I knew exactly what had happened. Too much time sitting at my computer over the last year. And the truth is, I always watch what I eat, but sometimes I don’t feel like eating healthy. Sometimes I want to eat junk food or eat too much. I like having choices. I love to workout but sometimes my workouts are a little hit and miss. Sometimes I don’t feel like working out, so I skip it once in a while. I love making these decisions. I’m going to take off this five pounds over the next month or so for two reasons. I don’t want to buy new (bigger) pants–I like the clothes I have. for an interesting view on this, check out the book “Mindless Eating” as our metabolism’s change it’s interesting to understand human grazing habits. It’s not about diets, but rather how we sometimes are influenced to consume additional calories. You may have gained weight but if you looked better and felt better, you probably have replaced fat with muscle, which weighs more..
Keep at it! All it takes is will power – oh, yeah, that stuff!